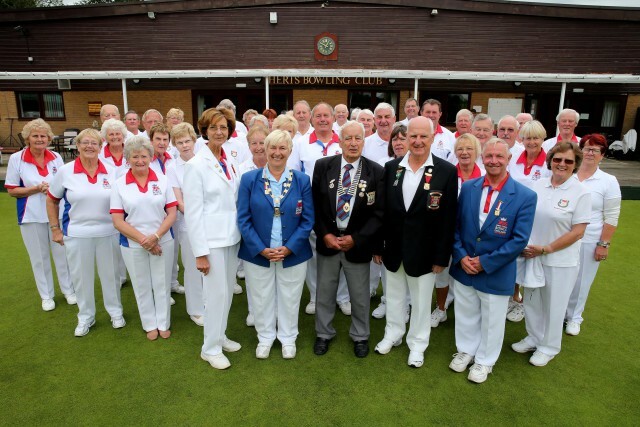 Herts (Watford) Bowls Club hosted the Bowls England President’s Team match versus ‘The Friends’ where Sue Sayers, Hertfordshire Bowls Ladies President was Captain for the day. On a fine day the green played well, after both teams had enjoyed an excellent lunch and had a group photograph taken. Marcia Dunstone, Bowls England President was unfortunately injured so could not play, but gave considerable encouragement to her team in a very keenly contested match where ‘The Friends’ sneaked a win by 4 shots (BE President’s Team 120 – FoEB 124). The Friends Top rink of Margaret Morris, Graham Robinson, Mike Skerry and John Thompson contributed significantly to ‘The Friends’ retaining the Ian Woodcock (EBA President 2006) Claret Jug presented to Captain for the Day, Mike Poole by Marcia. After a first class meal Sue Sayers, who is a Member of Herts BC, welcomed the Friends to her Club and made comments about the closely contested match. Mike thanked George, the Herts Bowls Club President for everything his Club had done to make the day such a success – Mike congratulated the caterers and Bar Steward for looking after everybody so well, following which gifts were exchanged and Mike presented a Personal Certificate to Marcia from ‘The Friends’. Mike concluded he speech by proposing a bumper toast to Marcia BE President and all of the BE players.